The end of vacation is always a mixed emotion time – you are a little sad to have a great time end, but by the same token it’s great to be back home and ready to face the work week. We had a great time visiting eastern MT and our son and family. 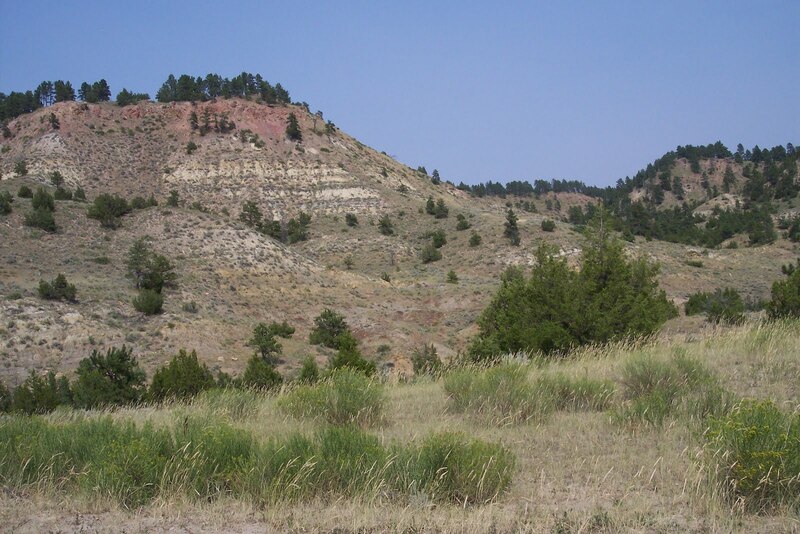 I am attaching some photos of the Miles City area…there is this beauty to the sparse hills that are magnificent in their color and shapes. After we left the kids on Thursday, we headed for Glacier Park. 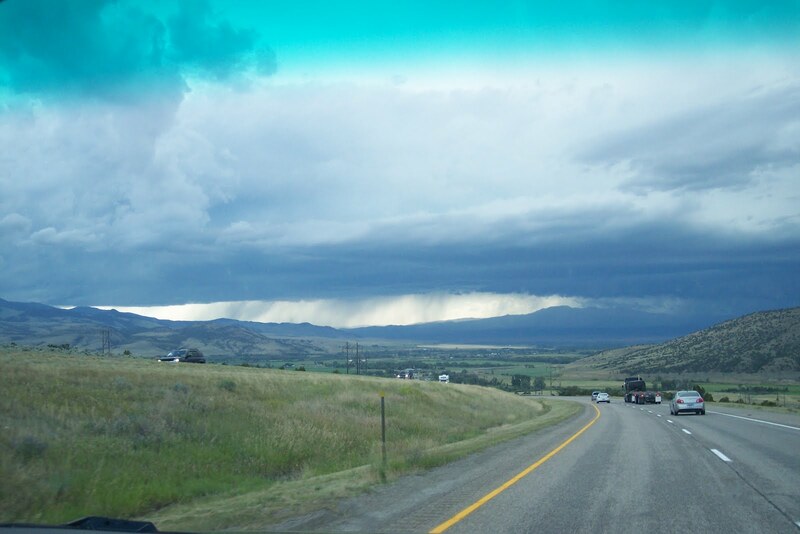 We experienced a first class, you can’t see to drive and have to get off the road, cloud burst of a magnitude that I haven’t seen for a long time…Les was amazed, never having witnessed a MT cloud burst. Kalispell and Glacier were beautiful. I had forgotten that the mountains are really in full bloom this time of year – how late the season is at 6000 feet. The Going to the Sun hwy is a masterpiece of work. Currently there is some repairs being done which restricted traffic to one lane. 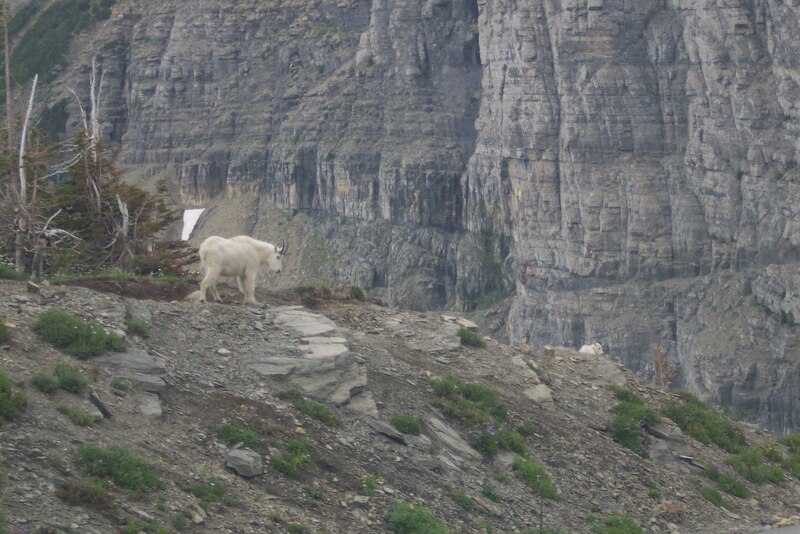 A treat it was atop Logan Pass 6000+ ft elevation to see 5 mountain goats – 3 kids and 2 adults. Next week it’s back to the grind…I have a wealth of reference photos new from the trip! Driving from Walla Walla to Miles City, MT is a 13.25 hour trip with minimal stops. Oh lordy are you glad to get out of the car at your destination! But when you are going to see your kids – you just want to “get there” and hang out with them. The drive takes ou through vastly different landscape….the wheat fields of the hills of eastern WA into the Spokane valley and the mountains of northern Idaho to the top of the Continental divide and “welcome to Montana” and down into the beautiful Missoula area, on I-90 through Drummond, Deer Lodge, Butte and Bozeman – some of the most beautiful valleys in the greater Rocky Mountain range. Once you get to Bozeman you head east on 90 through Livingston and basically follow the Yellowstone River valley all the way to MC. There are the wonderful sandstone rims along the river, the dry land wheat and grains and then to the badlands look of parts of eastern MT. I have been taking a bunch of photos – the Strawberry hills east of MC are badland-like, These buttes all together with great colors of strata are a palette to behold. So many colors in the soil and the interestesting shapes of these buttes. There is plenty of erosion as well, making them very interesting landscape. Our plan on the return to eastern WA hasn’t finalized – we will either go up north to MT-2 and across to Glacier or south to Cody and over to Yellowstone and Jackson Hole. Les hasn’t been north, so that’s probably the route of choice…so if that happens we want to stop in SandPoint and see some of the Art Walk which I believe is hanging now. So Sheila, if you see this…you may get a phone call to come and have coffee in SP!! Probably Saturday :-)…. I am going to the Art Center here today. There are not many galleries here…but there are some very good artists in this area. The art center is a regional center and hosts a variety of shows throughout the year. 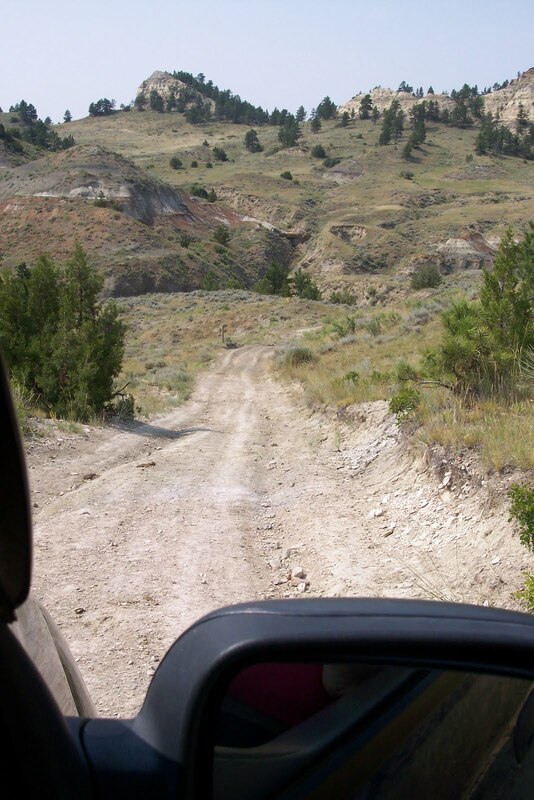 There is a lot of history in MC…it is well established in western history from the site of an early fort to a destination if not stop on a famous cattle drive trail (I don’t remember which). There is a famous saddlery here…the Miles City Saddlery, well known for their hand crafted saddles and leather. There is a new mayor here…an article about him in Montana magazine says that he thinks MC could and will be the “Taos of MT”. I can see tht potential…it’s a historical site and as I said before some of the most unique and varied landscape. And the real reason to go to Miles City is to see the kids…They moved here a year ago and we are missing seeing them regularly. I am skipping visiting friends along the way to selfishly spend vacation time with these guys and get to know their surrounds. I miss not having Chris,Michelle and Sam just a couple of hours away, but am happy that they have located in a great spot with friendly folks and the big blue skies. This is one of those “great places to raise a family” places. .I brought with me, “Going to Summer Pasture” and “Scenic Loop”. Thought that Chris should get the painting of his Grandmother moving cattle to the summer pasture and then the Scenic Loop to remind them of the beauty of eastern WA and the surrounds of the Blue Mountains.